The Good Shepherd pose set, using M4, the DAZ Lamb, and free shepherd crook. Little lamb on shoulders needs to be scaled down at least 80%, and may require some tweaking. Turn off limits. Free dynamic robe for M4 used, tutorial for it here. Also, Part 2 of tutorial is here, showing settings used specifically for the Good Shepherd project. 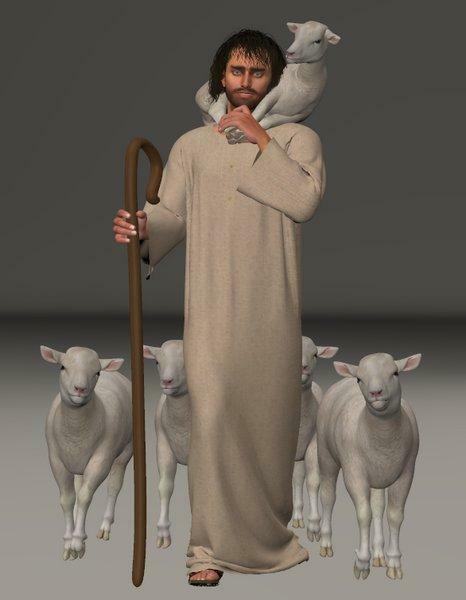 Today I've uploaded a PDF demonstration of the settings used for the robe in this Good Shepherd project...link has been added to the description on the upper right of this page. It's part 2 to the original PDF showing the basics of dynamic cloth using this particular robe in Poser. Oh yes, I'll be doing more, just need a break for rest. And yes, I plan to do some Old Testament stuff...I'm considering the Meshbox models of the Tabernacle and Noah's Ark at Content Paradise...if my system resources can take the big scenes, I think they'd make great teaching resources for 3D artists doing ministry. Be blessed this Easter! andolaurina (3 years ago) Inappropriate? Awesome! Thanks! I do hope you come back to the Biblical poses at some point...especially some Old Testament ones. Have a terrific Easter! Thanks again!! regilio (3 years ago) Inappropriate? thank you, Happy Easter !